HILARIOUS video shows a Tesco delivery driver desperately trying to free his van after parking on a grass verge. The hapless worker drives the van backwards and forwards in a vain bid to get back on to the road – as onlookers laugh and jeer. But the driver’s day went from bad to worse after he failed to extricate his vehicle after 15 minutes and had to be towed off the verge. The incident happened in Reigate, Surrey, on Sunday after the van parked on the verge in an apparently well-intentioned effort to avoid blocking the road. The clip was uploaded to Facebookk with the caption:“Tesco’s… Every Little Helps …” followed by three laughing emojis. 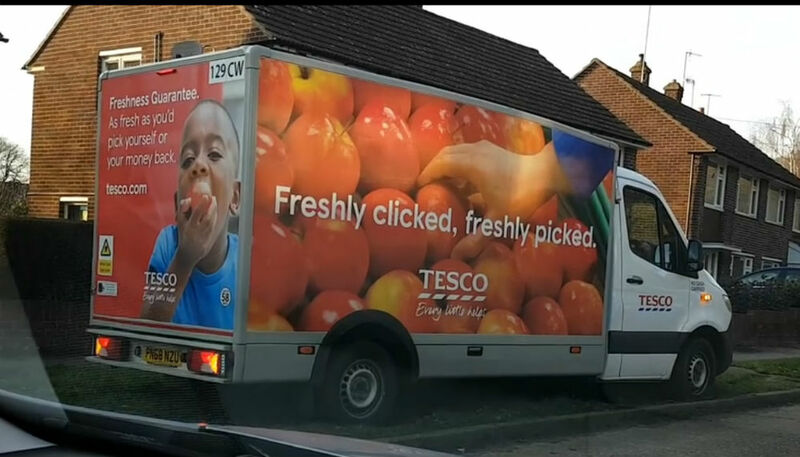 In the short clip, people in a car can be heard having a conversation as the Tesco driver moves backwards and forwards in a bid to release himself. But the backwards and forwards motion, combined with spinning rear wheels, only serves to make the problem worse. The person behind the camera, who did not want to be named, can be heard saying: “He ain’t getting out there. “Good luck with that.” The other passengers in the car can be heard laughing in the background. His friend can be heard saying: “We got a wide angle going for these bad, bad, bad Tesco Drivers. Others criticised the person who filmed and posted the video, including Johnny Reilly.